Earlier this year, Nielsen Catalina Solutions released a first-in-class study, revealing that influencer marketing delivered unprecedented ROI for a Fortune 500 brand. 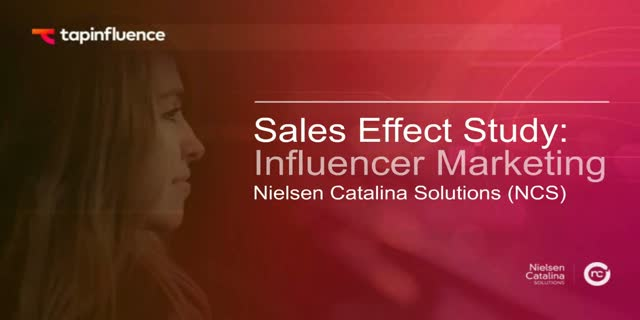 In this webinar, TapInfluence co-founder and CPO Rustin Banks and Joshua Books from Nielsen Catalina Solutions will unveil the marketing technology that made these results possible and expert insights into the campaign methodology. Watch this webinar and learn how TapInfluence was able to deliver an 11x ROI over traditional advertising using Influencer Marketing Automation. The goal of Demand Gen is to build and nurture key prospect and customer relationships, and the first step in achieving this is having a solid Tech Stack. Once you get the systems in place that support additional investment, you will begin to see results. The upside is that your sales team will get quality leads. Peter Drucker famously said “If you can’t measure it, you can’t improve it.” Good marketers make sure reporting and analytics are built from the ground up on a solid foundation that supports sales teams and eventually the business. Enterprise preparation for AI has centered almost exclusively on data prep and data science talent. While without data there would be no AI, enterprises that fail to ready the broader organization, chiefly people, process, and principles, don’t just stunt their capacity for good AI, they risk sunk investment, jeopardize employee trust, brand backlash, or worse. Ensuring sustainable deployment starts with assessing enterprise data strategy, aligning myriad stakeholders, technological feasibility assessment, and a coordinated approach to ethics. Join VentureBeat and industry analyst and founding partner of Kaleido Insights, Jessica Groopman for discussion on the five fundamentals of AI readiness at our upcoming VB Live event! The subscription model is booming --subscription commerce grew more than 100 percent each year between 2011 and 2016, and the growth continues. Savvy companies are reaping the rewards: high recurring revenue that’s predictable paired with a competitive and sustainable business model. The potential ROI for global expansion is wide open, but many who try to take their subscription model global overlook important issues that can make or break success in new markets. Learn about the best practices to expand your subscription business into new countries including how to manage local payments, get the right partners on board, optimize authorization rates, tackle key challenges in potential markets, mitigate fraud, and more when you join this VB Live event! It's no secret that brands today are investing more money than ever in marketing technologies to gain better insight into customer preferences and behavior. We rely heavily on these systems to collect data and deliver the best experience for engaging and converting visitors. However, when this data isn’t shared between your vendors, you may be overlooking a big opportunity to maximize return on your investments. This webinar will explore 3 ways to power intelligent marketing campaigns by leveraging real-time data you already have, as well as examine a more practical take on how to extract value from connecting data across your entire technology stack, allowing more timely, relevant, and meaningful interactions with the customer. If it's done right, ROI is the ultimate marketing metric. There are few marketing initiatives that aren't ultimately supposed to strengthen the bottom line. Yet without a clear idea of how your campaigns are targeted, and what your objectives are, a fuzzy focus on ROI becomes an insecure and confusing metric. So how do you do it? When should you start focusing on ROI as your main metric? How do you encompass all the different ways in which marketing outreach (email campaigns, in-app messaging, retargeting, segmentation) contributes to and multiplies ROI? Join us for this executive session and register for free today. In Part 1 of this compelling Masters of Mobile Data series, you'll learn how to acquire high value users the right way. If you build it, they will come. Right. That may be the hope of many mobile app publishers, but it’s not even remotely true when it comes to the battle for quality users in 2016. And while most app publishers know it’s essential to have a fierce user acquisition strategy in place, what that consists of and how they put it into practice is another thing altogether. That’s why VentureBeat took a deep dive into mobile user acquisition. We were determined to find out what’s working for successful app publishers, what you should be paying to acquire high-value users, and which user acquisition solutions you need to partner with in order to have an ironclad UA methodology in place. In the process, we surveyed over 700 mobile developers with a billion users among them. We also studied data summarizing the results of almost 14 billion mobile ads, and talked to leading user acquisition experts. Of course, you could read the full report -- or you could tune into this not-to-be missed webinar that will cover the most essential takeaways needed to hook those quality users. With the continued explosion of digital and data-centric technologies, a rich stream of customer data is increasingly available to today’s marketers – and a company’s first-party data is undoubtedly a growing source of competitive advantage. But the opportunity to generate deeper customer insights and understanding with that data comes with the expectation of a connection or interaction that goes beyond the transactional. Attend free webcasts to learn how leading technology vendors are successfully mapping marketing tactics to their target audience's buying cycle. During these live webcasts, which are also available on-demand, marketers will discuss how their company has changed its approach to awareness, demand generation, pipeline nurturing and customer engagement to dramatically improve results. Don't miss this opportunity to get useful insights for your own marketing campaigns.